Rush’s 1976 album classic, “2112”, will be released for the first time on colored vinyl on April 27. 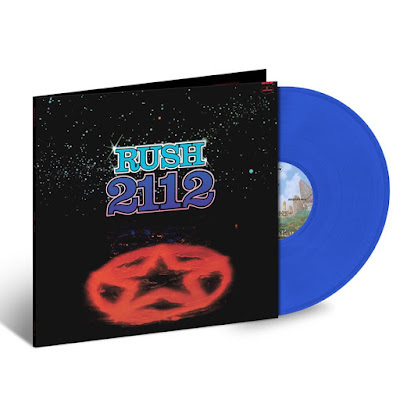 The limited-edition opaque blue 180-gram vinyl features the 2015 remaster by Sean Magee at Abbey Road Mastering Studio and a "red star of the federation" hologram in Side 2 run-out groove. “2112” delivered Rush’s commercial breakthrough, becoming the band’s first album to reach the Billboard 200 and their first to achieve Gold sales status in the U.S. (it was later certified Platinum) while earning their first platinum album in Canada. The Canadian trio released multiple expanded 40th anniversary editions of the 1976 set in 2016. Beyond the original record, the project featured rare, live and previously unreleased material and a DVD featuring newly-restored vintage 1976 Rush concert recorded at the Capitol Theatre in Passaic, NJ, among other items. Following a 2013 induction into the Rock And Roll Hall Of Fame, Rush performed the final show of their 40th anniversary R40 Live tour at The Forum in Los Angeles on August 1, 2015, marking the last concert appearance by the legendary rockers.